The people of Kalumpang, in the region of the Sa'dan highlands to the northwest of Tana Toraja, are famed for their production of ikat textiles, which were used for ceremonial display or as shrouds. Papori means "wrapped" or "tied," a reference to the ikat process; Noling is the name of the place in Kalumpang that was a center for the weaving of this style of cloth. Thus the name Papori to Noling means "ikat weaving of the Noling people." Kalumpang weavers produced cloths with double the density of warp threads compared to those of Rongkong, their neighbors to the east, whose textiles are rather loosely woven. This density of warp makes their textiles exceptionally durable. The Kalumpang weavers were also highly skilled in dyeing, as well as in the process of tying the warp for dyeing, resulting in designs of impressive crispness. In the best examples, repeated steeping of the threads in the dyes produces, as seen here, a wonderful saturation and richness of color. This process may extend over weeks or months. the main colors used are blue from the indigo plant (indigofera tinctora) and red from the roots and bark of the Morinda citrifolia, or Indian mulberry (known as bangkudu to the Toraja). Blacks and browns of varying hues are produced by overlaying red and blue. 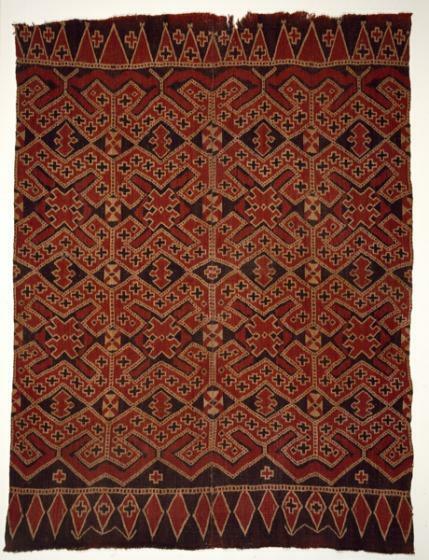 The complex angular patterns of this textile, with their four red projections, look almost like abstractions of the human figure in a line dance, tightly interlocked with red bands featuring a small brown cross motif. The result is exceptionally rhythmic, vibrant and vigorous, a masterpiece of women's artistic creativity. Very little modern ethnographic research has been done in this region of Sulawesi, and today it is difficult to provide in-depth accounts of these cloths and their production. Both Kalumpang and neighboring Rongkong suffered devastation during the 1950s as a result fo attacks by Buginese Muslim guerrillas of the Darul Islam/Tentara Islam Indonesia (DI/TII) movement led by Kahar Muzakkar. Many large old houses were burned, and weaving almost stopped; some fine cloths from this area have survived precisely because they had been traded to neighboring peoples who have carefully treasured them as heirlooms. Today, some women have returned to weaving for the tourist market, with cloths being traded south to souvenir shops in Tana Toraja. Few of these new cloths are made with homespun cotton or natural dyes. But the members of a recently formed cooperative, with the support of an Indonesian fair-trade organization, Threads of Life, are reviving traditional dyeing techniques and regenerating the weaving heritage of their mothers and grandmothers. Roxana Waterson, "Shroud or ceremonial hanging (Papori to Noling)," in Eyes of the Ancestors: The Arts of Island Southeast Asia at the Dallas Museum of Art, ed. Reimar Schefold in collaboration with Steven Alpert (Dallas: Dallas Museum of Art; New Haven and London: Yale University Press, 2013), 200-201.